Chief of Defence Staff Ravindra Wijegoonawardena arrested! -- Journalists harassed in court! abetted him by providing him safety. On the occasion when the case relating to the 11 persons who disappeared was called today (28) in court, he was named as the second suspect of that incident by the Criminal Investigations Department. After court proceedings today, Fort Magistrate ordered the case be adjourned till 2.30 today and issued orders to Fort Officer-in-Charge to be present in court immediately. The chief of defence staff who had come to court in uniform had set off in his vehicle after the case was adjourned till 2.30 and on arrival to court dressed in casual clothes after that was taken into custody. Colombo Fort Magistrate who rejected granting bail ordered that he be sent to remand prison till 5th of next month. Allegations have been made against the chief of staff for being connected to assaulting and threats to life of Navy Lieutenant Commander, Mr. Laksiri Gamage for having given evidence against chief of defence staff Admiral Mr. Ravindra Wijeygoonawardena thus exposing the incident. A certain person has assaulted some journalists outside court premises as they had been to cover the court proceedings at Magistrate's Court today. The journalists concerned have lodged a complaint in this connection with court guardroom. On the occasion when this case which began this morning and was adjourned till 2.30 in the afternoon, when the chief of defence staff was getting ready to come out from court premises a person who was with him supposed to be a naval officer had attacked journalists who were there. This person who so attacked was arrested by police officers who were there. 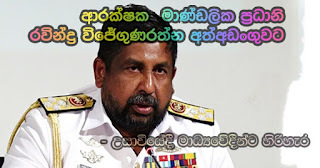 The admiral is a person who incidentally has created sensational news before this for having treated a journalist with harsh words at port premises in Hambantota. Police officer Mr. Nishantha de Silva who filed action in relation to his court case was accused of LTTE allegations and the Inspector general of police who in turn tried to transfer him misfired and in the face of public opposition he was reinstated.